The last week or two has been for reading from my ongoing series, ones I haven't touched for many months so it's been huge fun revisiting characters that feel like old friends. 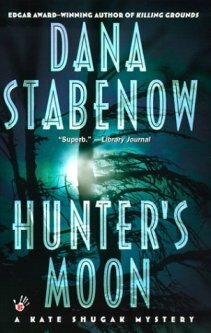 First up, Hunter's Moon by Dana Stabenow - book nine of the author's Kate Shugak series. Kate Shugak and her boyfriend, Jack, are acting as guides on a hunting expedition in the wilds of Alaska. Kate is an experienced guide. The hunters are a group of Germans from a German company that is in trouble financially in Europe. They're not a particularly pleasant group of men, plus one woman, and Kate has a bad feeling about them. This feeling is reinforced when one of their number is accidently shot dead. But was it an accident? I wasn't very enamoured of this one until about halfway through. The hunters were particularly obnoxious and I'm not great with situations where animals are killed for sport. But it really picked up later in the book and actually became rather exciting, plus, massive shock occurrence, *massive*, was not expecting that, so it got four stars on Goodreads instead of three. Next, Black Diamond by Martin Walker, book three of the author's Bruno, Chief of Police series. The Perigord region of France is famous for its truffles and large amounts of money change hands during the season in autumn and early winter. Bruno gets word that someone is interfering with the Perigord truffle when it's being sent off to restaurants in Paris and suchlike, inferior Chinese truffles being exchanged for the genuine article. 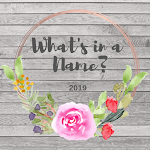 One of Bruno's closest friends is found brutally murdered in the forest but is it to do with the truffle smuggling or his links to the French wars in Algeria and Vietnam? I quite like this series but in this book felt Bruno was bordering on too good to be true. But the plot concerning truffle shenanigans and tensions between the Vietnamese and Chinese communities in France was quite gripping and fascinating... I had no idea that the latter problems existed to be honest. Bruno's private life continues to be complicated but that's fine, the lovely details of life in Perigord continue to engage and I will definitely carry on with this series. 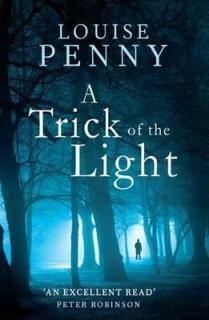 Lastly, A Trick of the Light by Louise Penny, book seven in her Armand Gamache series. Clara Morrow has the first ever exhibition of her artwork in Montreal and Chief Inspector Armand Gamache goes to the vernissage with his wife and a couple of police colleagues. A BBQ party takes place in Three Pines, after the event, and a lot of people from the exhibition and village attend. The next morning the dead body of a woman is discovered in Clara and her husband Peter's garden. It's revealed that the dead woman is Lillian Dyson, a childhood friend of Clara's whom she fell out with in her early twenties. But Clara is not the only person who knew Lillian it seems. The dead woman had been an art critic, specialising in scathing reviews which ruined the careers of budding artists. Who among the guests at Clara's BBQ hated Lilian enough to kill her? Words can't express how much I like this series. It has improved with each book and reached a degree of excellence which many series never achieve. This one told me probably more than I thought I wanted to know about petty wars and alliances in the art community in Montreal. Whether this is true to life or not I don't know, but I suspect it's close... it's not at all my world but I was fascinated by it. And of course all the regular characters are so well drawn, all of them a mix of good and bad but growing and changing all the time. I particulary like the mad poet, Ruth, in Three Pines and her relationship with Jean-Guy Beauvoir. I feel like I haven't had enough of Three Pines to quell my thirst for it so have reserved book eight, The Beautiful Mystery, from the library... it's about a monastry in Quebec, can't wait. It just occurred to me how much travelling I've done with these three books... Alaska, Perigord in France and then Quebec in Canada. And now I'm off to Switzerland! I haven't read in 3 weeks! I hope to get back to the book I was reading before my surgery.. I hope.. sooon! As to the Penny book - well, you're getting into the really good stuff - not that the previous books haven't been good - however, the next book is excellent and quite interesting for the setting. Ah, you have a lot of great storyline to experience. I so love series that I can get really, really invested in. Wow! you are getting into reading some very firmly entrenched series, which I can't realistically ever hope to catch up with, although I really do wish that I had got into reading the Armand Gamache books by Louise Penny. The authors have all also written one or two stand alone novels, so they might be worth my while investigating at some point in the future. At least that will give me a taste of their individual writing styles. After all the rain we had yesterday, it would have been good to be able to get out in the fresh air today, but alas, all the housewifey duties demanded attention, although I feel that I have actually achieved very little. I like the Martin Walker books, though I haven't read any in a while. The last one I read was The Resistance Man, 6th in the series, and then a short story/novella A Market Tale. I'm drawn to them, but sometimes in the midst of the story, I feel it is too intense for me. Maybe not reading them at bedtime would help! Pat: I hope your recovery is going well. Hardly surprising you haven't felt much like reading. Kay: Laughing that you were waiting for me to get to 'that' book in the KS series. Very powerful writing in that section, I was moved to tears. Yes, I think I'd realised that the AG books were moving, or 'have moved', into an excellent block of books. The promise was always there I think, right from the start, but they're getting really superb now. I think they may be my favourite series of the moment. Yvonne: I think you would love the Gamache books but understand your reticence to start on a long series, it takes a bit of catching up and you don't have a lot of spare time for reading. Housewifey duties are a real bind aren't they? I have a bit of a cold at the moment so those sorts of chores can wait for a day or two while I recover. Nan: You're farther along with the Bruno books than me. So far they haven't been too bad but I wasn't so keen on the violence of the Vietnamese/Chinese gangs theme of this one. It's reality I suppose, but it makes for hard reading. I think it's been a little while since I dropped in--please forgive my absence. I do think that this 9th Dana Stabenow novel might be the book that's worthy of reading the series out of order. I've read the first novel only. But it does sound so good. Ken enjoys this series, too, so I'll pass the word along to him. Yes, November in the Adirondack Mountains is a contrast to our Nov. weather when we lived in Boston. Boston gets some sun in November, but here there are Very, very few hours of sun from mid-October to January. We get just a wee bit of peek-a-boo sunshine per week. It's the Great Lakes' effect. We're directly west of Lake Ontario and the cooling waters on the lake blow cold moisture west and loads of clouds (and rain). Happy curling up with books in November, Cath!! 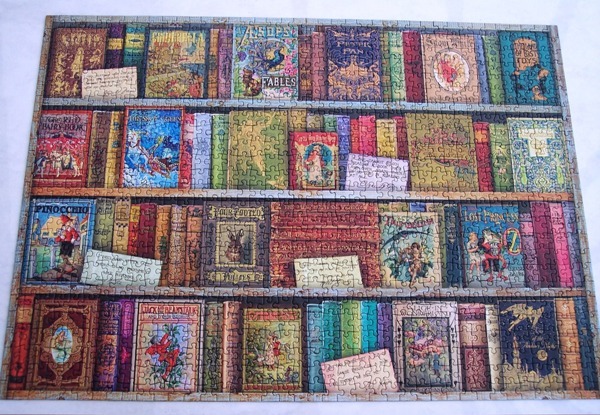 Oh, and I love the two puzzles you photographed. Judith: No problem at all, sometimes life gets very busy and there isn't time for everything. With Dana Stabenow's series it's important to say that they get better after that first book. I wasn't all that smitten with that one and didn't read any more for a number of years. I wish now that I'd carried on sooner. It's lovely hearing about where you live. We did explore a little of upstate New York in 1996 but not enough for my liking. We stayed in Watkin's Glen and and drove all the way around Lake Seneca, we thought it was a stunning area and would so love to go back.